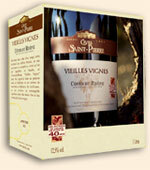 Production seal of quality from Caves Saint Pierre, a winery present in Châteauneuf-du-Pape for over one hundred years. Côtes du Rhône Vieilles Vignes is exclusively made from 40 years-old vines' grape varieties, carefully selected in the southern Rhone Valley and characterized by twisted vinestocks. The wines were carefully matured in our storehouses, in vats to give them the best preparation for bottling and to enhance the quality of their flavour. The age of the vines intensifies the character of the Grenache, Syrah & Mourvèdre grapes resulting in a delicious, full bodied and aromatic wine.